This tutorial is meant for those who have no or little experience using Shake. 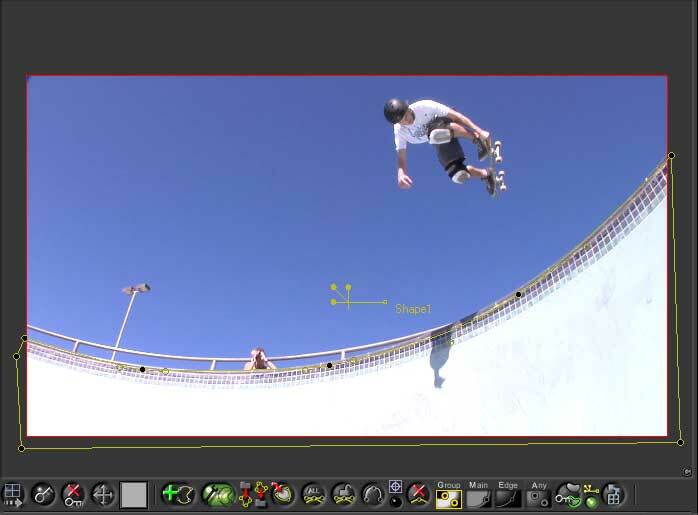 We will briefly cover Keying, Tracking, Rotoshaping and some basic compositing. The aim is to create an alpha channel. 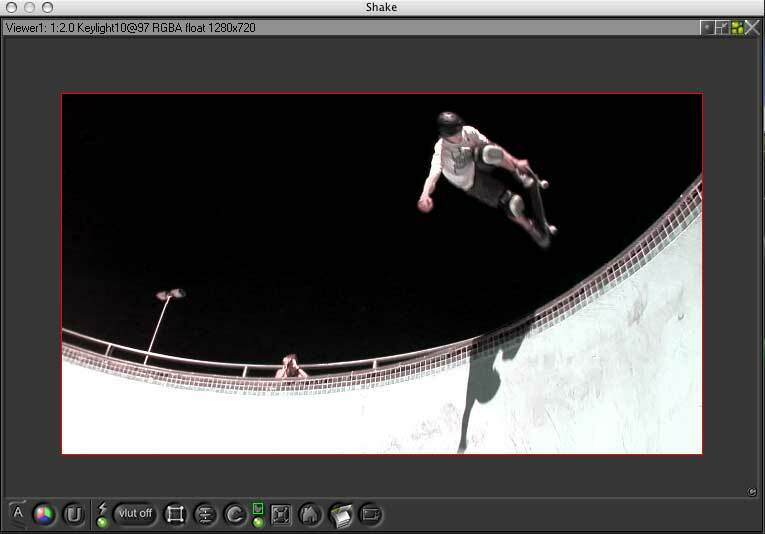 Not long ago I shot a skateboard pro in our local skatepark in Bondi Beach to try out my new Panasonic HVX 202. I was interested in seeing the capabilities of the DVCPRO HD codec in terms of compositing. DVCPRO is only 8-Bits but it has a color sampling of 4:2:2 which in theory should make it decent for chroma keying. As you can see, the bowl is very overexposed but that was a necessary evil in order to get the perfect blue in the sky needed for the key. Australia has very harsh lighting conditions in the middle of the day and this is what happens with such a limited format. 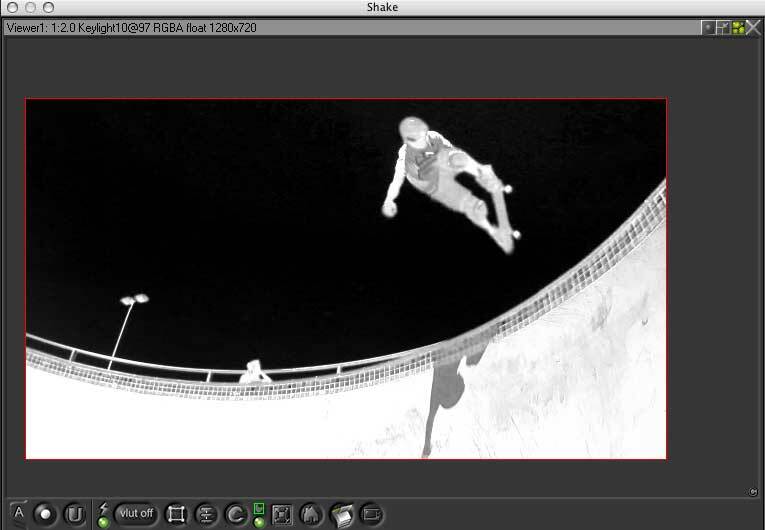 Since the Skater is only in the air for a few seconds, the footage I am using is only 43 frames originally. I slowed that down to about 150 frames using the Speed function in Shake. This was only possible since I shot it on 50fps in the first place as opposed to 25fps which would have made it impossible due to the lack of information between the frames. This is what the footage will look like after tutorial 2. This first tutorial is written for basic Shake users. There are certainly many different ways of reaching the same results and this is only one of them. The purpose of this tutorial is to give you a good starting point from which to explore this application more in-depth. We will start by removing the blue sky using Shake's Keylight. Keylight is an incredibly solid keying tool that lends to almost infinate flexibility. 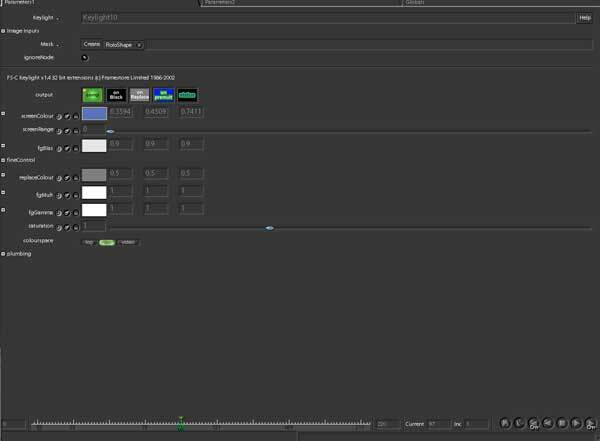 Those of you that are used to keylight in After Effects will be impressed by the difference. To import your footage into shake simply drag from your folder onto the viewer in Shake. Alternatively, go to Image/filein. You will find that Shake displays a different file structure than most other applications as it uses Linux to navigate rather than OSX front end. Before we apply Keylight we are going to add something to our footage. Select file you imported and go to "other" in the menu tab. In "other" there is a node called Bytes. Apply this node by clicking on it once. Click on the tiny square on the right side of the new node and the parameters will be loaded into the window on the bottom right of your screen. The right square loads the parameters but leaves the viewer as is whereas clicking the box on the left side of the node loads the visuals of that node into the viewer but leaves the parameters as they were. Double clicking on the node loads both. You can see which node you are viewing by checking the color of the left box. If it is green that means it is active. You will see that node and all the nodes that are above it to the left. 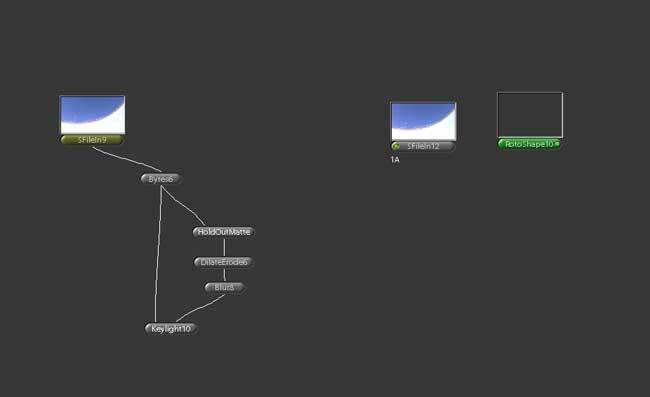 That's the way the node "Trees" hierarchy works in Shake. It starts at the top left and moves down to the right. 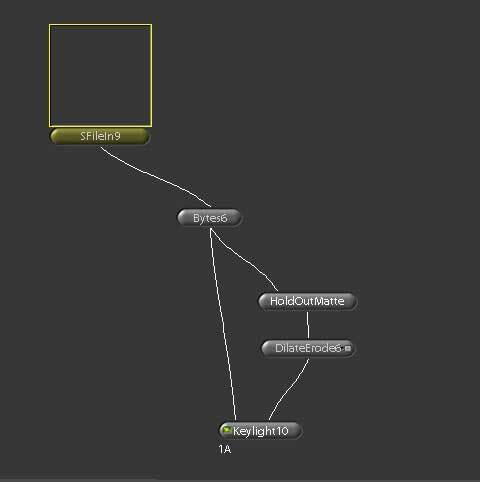 In the "Parameters 1" tab you will get some information about the node. Don't worry about "Parameters 2" or "Globals" at this stage. 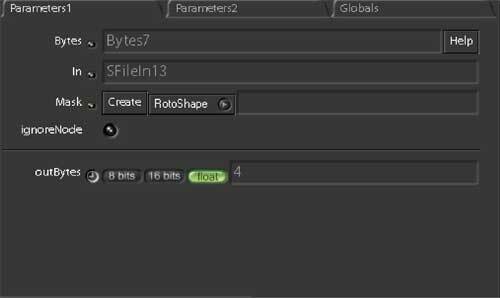 Change the outBytes option to "float". 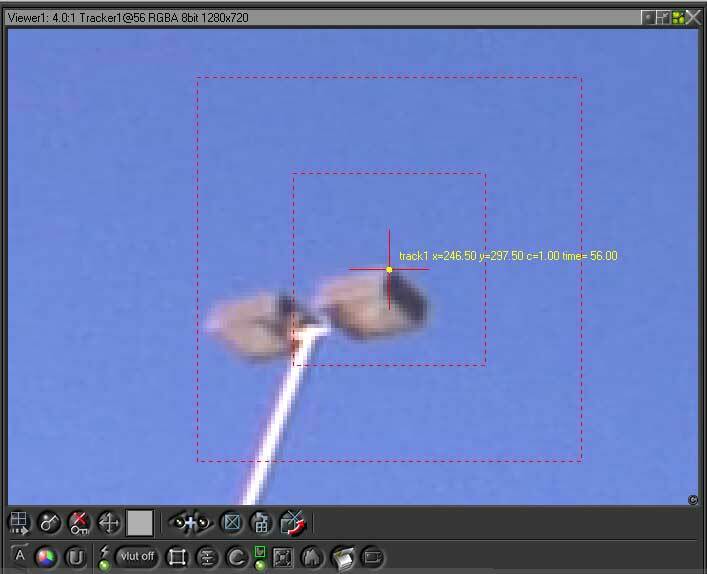 Although this node does not increase the quality of the image, this node does enable you to apply some effects and grades of higher bit-depth than before. 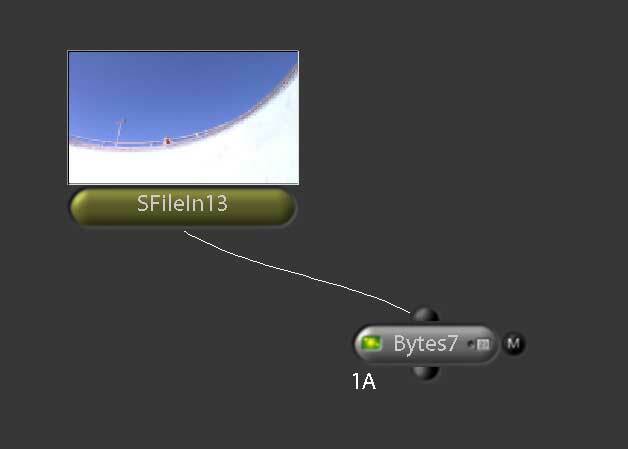 Select the Bytes node in the viewer. Go to the Key tab on your menu and choose [CFC] Keylight. As you can see, Keylight has 4 inputs on top as opposed to "bytes" which only has one. If you drag your mouse over the inputs you will get an explanation of what they are for in the very bottom of the screen, just under the timeline. You are currently connected to the input furthest to the left, which is the Foreground or "fg". The next input to the right is the Background image, the third is a "holdoutmatte" which I will explain later in this tutorial. The fourth Input is for a garbage mask. All nodes also have an input on the right side titled "M". M stands for Mask. The mask is useful if you would like to limit a node's effect to only a part of the image. Now open the parameters of Keylight. If you place the mouse over that [or any] window and press spacebar the tab will automatically take up the entire screen, making it easier to tweak the sliders. Lets start by choosing the color we want to key or "remove". Select the "ScreenColor" color palette and it will load up in your viewer. We will select our color by dragging the mouse over the blue area we want to key. When you drag the mouse over the image you will see that the grey color is replaced by black. That black is the newly created Alpha channel. At first glance it looks like a decent alpha channel. Lets have a closer look. Move the mouse cursor over the image and press "a" on your keyboard. Pressing "a" shows you the alpha channel. You can press "c" to go back to color but lets leave it on alpha for now. As you can see now the alpha is not perfect. 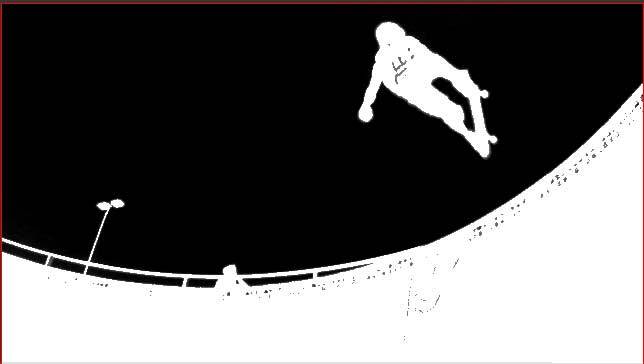 The skater is not perfectly white as he should be. Neither is the bowl. The area around the skater on the other hand, is quite black, indicating a decent alpha channel. 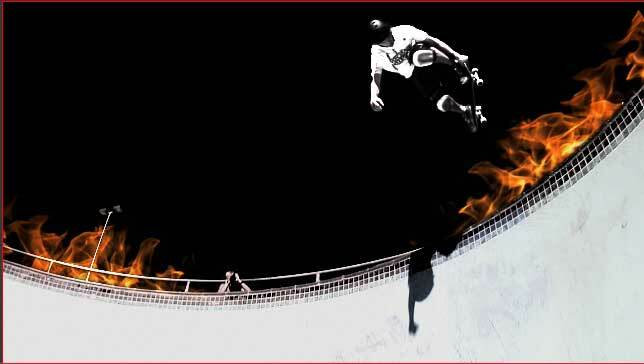 Since we are happy with the alpha around the skater lets concentrate on the skater himself. He needs to be perfectly white for the alpha to be good. 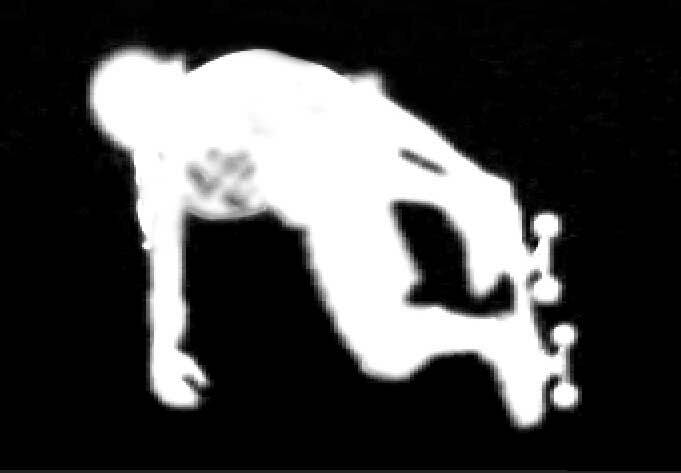 Any black or grey areas on the skater indicates lower than 100% opacity, making him partly see-through which is not really what we are after. One way of doing this would be to get to the "screenRange slider" in the Keylight parameters and crank it up. You'll find that although this makes the skater whiter, it also ruins the feathered edges and makes the alpha "pixelated" and rough. This will remove some of the grey spill in the black section just above the skater. 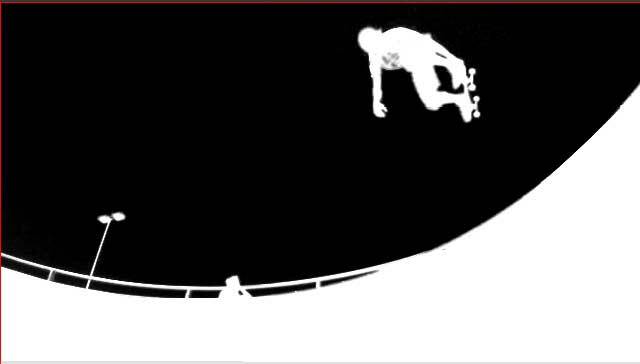 The edge of the skater is fine, but the area inside the skater is mostly grey, not white. 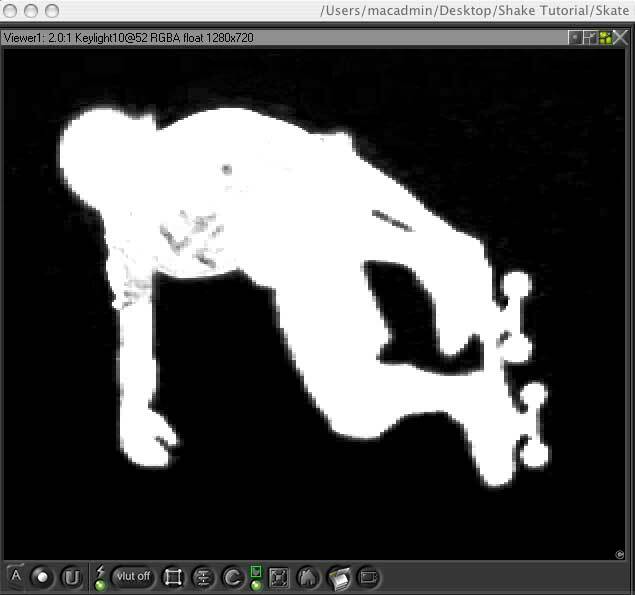 We could apply a mask and rotoshape the grey and black bits of the skater. Or we could paint the sections white and keyframe it. This would work but it's a pain in the arse to say the least, and it would take way to long. Usually those options are used for the final touches on an alpha if the key does not work perfectly. Lucky for us, Framestore UK, the company that developed keylight thought of this and included a great solution called HoldOutMatte. A holdout matte is simply another keylight applied to the same image. The holdOutMatte however is applied on top of the first key and then shrunk (or eroded) so that the edge of the alpha is not touched leaving the edge soft and the alpha sharp. Attach the new Keylight node to the Bytes node and then attach it to the third input from the left on the original kelight node. Rename the new KeyLightNode and call it "HoldOutMatte". Now open the parameters of the holdoutMatte keylight and increase the screenRange until you are happy with the result. I pulled it up to about 0.1. This makes the skater almost completely solid. To fix the edges we are going to shrink the holdOutmatte and then blur its edges. Apply a DilateErdode node to the holdOutMatte. In the "pixels" parameter inside the DilateErdode node set the value to -0.6. You can do this by dragging the mouse over the value or by just inserting the number straight into the value box. Applying a positive value to this node will dilate rather than erode, but since we want to reduce the size of the HoldOutmatte we will applya negative value. The next step is to feather the edge between the HoldOutMatte and the original keylight. 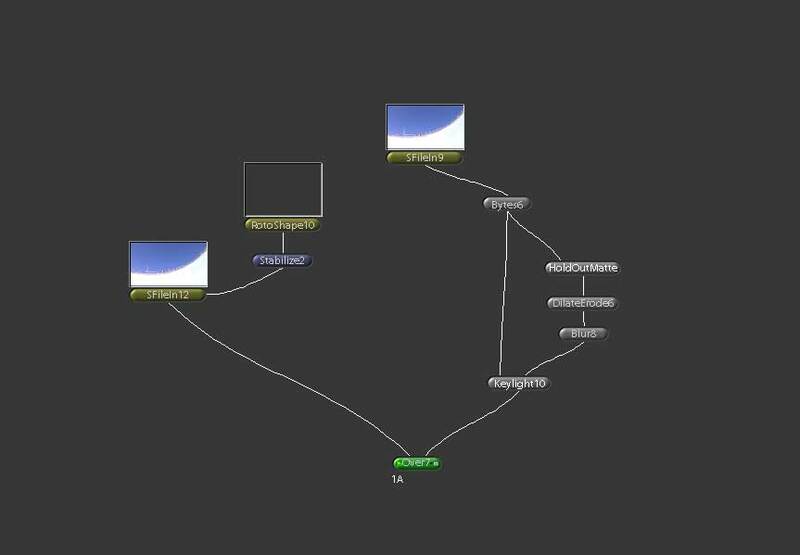 Simply apply a blur node to the DilateErode node to create a more feathered edge. I applied a gaussian blur of about 10 pixels in diameter. The skater still has some "holes" of grey in his alpha due to the fact that his shirt had some graphics on it that were blue, the very same color we tried to key out. These imperfections are can be removed with a number of different techniques. I generally just paint them out or mask them, but for the sake of this tutorial we are going to pretend that they are not there. Since we are happy enough with the skater we will now move onto the bowl. As you can see, the edge of the bowl is fairly good as it is, although there are some sections of the bowl that have "holes" in it. We could paint these holes out but there is an easier way, we'll just apply a mask and then match move the mask with the [minor] movements of the camera. This sounds complicated but it is actually very simple. Now go to the "image" tab and select the "Rotoshape" node. Now we are going to track the movement of the camera so that we don't have to animate the shape of the mask. Start by applying a Tracker node to your filein node. The Tracker node can be found under the "Transform" tab. Move the tracker to a spot on the screen that has a sharp edge. I chose to move it to the corner of the street lamp. You can zoom in on the image by leaving the cursor over the image and pressing +. - Will zoom out again. The two boxes that surround the tracker cross are the there so that you can select the area you want Shake to search for your mark within. If your image moves a lot, then make this area bigger. You can also choose to use several trackers on one image which is very handy if you want to track rotation or skew but we don't need it at this stage. 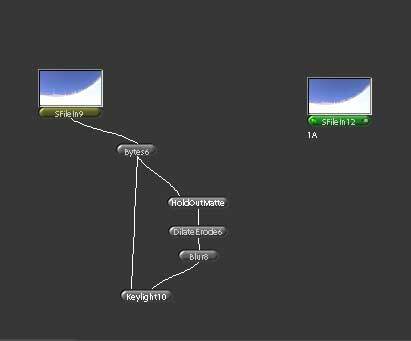 The Tracking node within Shake is very accurate. Those of you that have used After Effects will know what I mean, the difference in is quite impressive. When you have found a spot you are happy with set the tracking range. I am only interested in working with the frames 34-77 so that's all I will track. It can be useful to name your track so scroll down to Track1Name and type something in. I chose "SkatingTrack". If you press the left arrow Shake will track backwards in time. Scroll the timeline to see how it worked out. As you can see Shake has created a perfect track. Now all we have to do is apply this movement to the mask we just made. 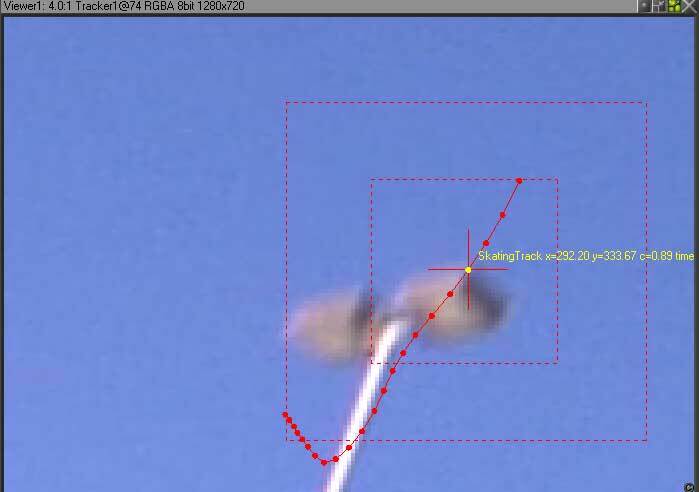 First attach the Rotoshape to the mask input on the FileIn. Then remove the "tracker" node. We don't need that anymore. 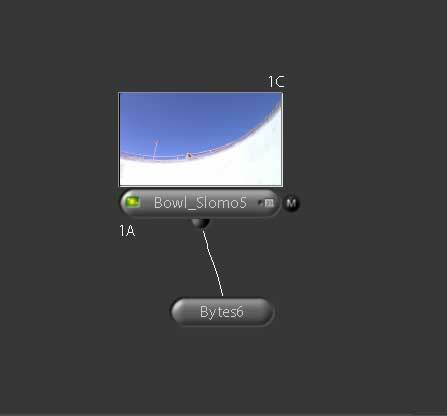 Instead, attach a Stabilize node to the Rotoshape node. 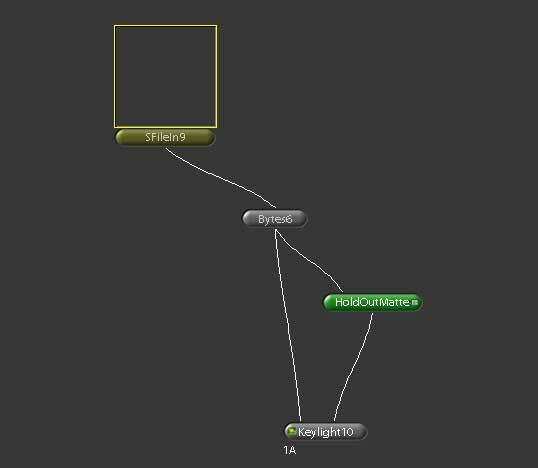 In the Stabilize node, select the "active" function, then select "match". The next step is to load the track we just created. Scroll down to track1Name and rightclick. Select load and choose the track we created before: Skater. Now all we have to do is place this comp OVER the other comp where we used Keylight. This is simply done with an Over node. The Over node can be found under the "Layer" tab. Our Alpha is now good enough to move on. In the next tutorial we will paint out the grey areas on his shirt, slow the footage down, grade it and then add the fire.